Adding a new stainless steel or aluminum structure to your yacht or boat is a major project. It costs quite a bit of money, and will take some time – so you need to make sure that you partner with the right service provider for marine welding in Fort Lauderdale. But should you use a single contractor for both marine welding and the fabrication of your metal structure? It’s a question worth asking. It may seem that you can get a better deal on your project if you use a specialized manufacturer for fabrication, then simply ship the finished structure to a welding company who will install it on your boat. But this is not the case. In fact, choosing a single contractor for both marine welding and fabrication can have some major benefits. Let’s take a look at these now. When you partner with a fabrication and welding company like K&G Marine Welding, you get fully end-to-end service. You can trust us to take great care of your vessel, and it never has to leave our facilities. Because we handle both fabrication and installation/welding of metal structures, your project can be streamlined – and you can get the best results in the lowest possible time. If you don’t choose a single service provider for both marine welding and fabrication, your project is going to take quite a while to complete. Parts and components will have to be shipped between contractors – and there’s always a risk that something will go wrong. If you choose to outsource the fabrication of a metal structure to a company that has never seen your yacht, you’re putting yourself at risk. But if you choose a company that will manufacture and install a new metal structure, they will be able to ensure that your specifications and design are proper, and a good fit for your vessel. If any issues are detected, they can be resolved – before the entire structure has been built. When you choose a single contractor for marine welding and fabrication, you can ensure that you get good results. You’ll have a single point of contact to check on progress, and everyone working on your boat will have been involved from the very beginning. This means that they understand the project perfectly – and can deliver the exact results that you are expecting. This makes it much easier to take care of any minor issues you may have with your structure, or even any warranties associated with your new installation. If you continue to use the same contractor, you will be able to develop a good working relationship – and they will have the information and data about your yacht that they need to make future recommendations for repairs and renovations. Interested In Metal Fabrication And Marine Welding In Fort Lauderdale? Contact Us Now! 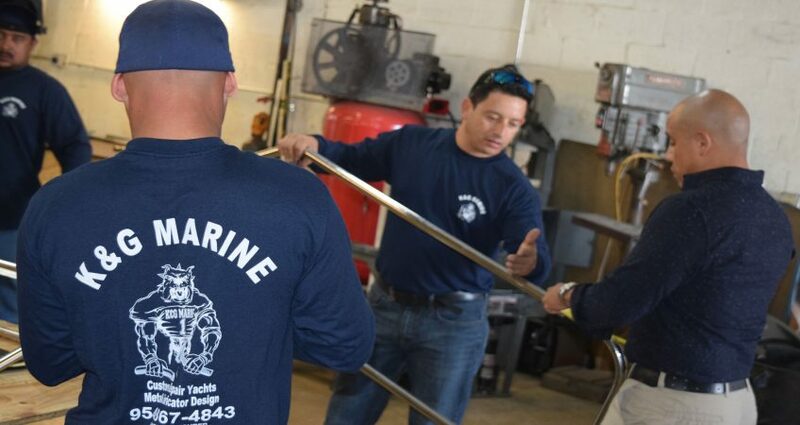 We’re the best choice for marine welding and metal fabrication in all of Florida. With multiple welding specialists and on-site fabrication facilities, we can handle jobs of any size. From small cruisers to gigantic megayachts, we’ve done it all. Take a look at our past work now. Interested in working with us? Please contact us right away with more details about your project!